A few days ago, I was privileged to speak to the women of Grace Immanuel Bible Church in Jupiter, Florida. They had asked me to recount the ways in which the Lord blessed Gary and I throughout his years with dementia. Recalling the sweet grace of God poured out on us, and thinking through how ANYONE can take hold of grace, was a joyful experience for my own heart. May you be encouraged, and strengthened in your own situation as well. A bonus blessing for me was being introduced by my sweet April, who made me get a little misty-eyed right before speaking! After our time of worship and study in the Word we were served a lovely tea by the men of the church. It was a wonderful day with these dear sisters in Christ. Audio of my message, click HERE. Printable PDF version click HERE. It was 3:15 am and the alarm was going off. Thankfully, my husband did not wake up. I slipped out of bed and quietly got ready for my day. The night before I laid out my uniform so I could find it in the dark. It was imperative that Gary stay asleep until 8:00 am when I would return from my opening shift at Starbucks. This particular day, I had a migraine. I would end up sick at work, but since I was one of two openers, I had to be there until a replacement arrived. 2 hours later they came and I went home, feeling miserable. I was 56 at the time, and every one of my coworkers were younger than my daughters. The pace was fast and hard for me. I felt out of place and exhausted at work. At home, my responsibilities had doubled because my husband, Gary was changing, and so our world was turning upside down. We were being led down into a dark valley, forcing changes we never would have wanted or imagined. In that valley, I came to see my weakness. Every day. AND in that same valley, I came to know strength that I had never known before. Today, I get to tell you about those weaknesses, and how Christ uses our suffering to display His power in us. 10 years ago, life was rolling along. We’d been married 32 years. We had a small electrical contracting business, and were serving with College ministry at church. We were living in the same house since we got married. We were enjoying our grandkids and occasional travels to visit family and friends. But around this time, Gary began to have difficulty with his thinking, particularly with problem solving. This showed up in his work first and then other areas. We wrote it off to being over-worked and super busy, but his cognitive problems got worse so we went to the Doctor. After months of testing it was determined that he had Early Onset Alzheimer’s Type Dementia. He was 57. (Alzheimer’s is the most common form of dementia. It’s like reverse development, from Adult to Youth to Child to Toddler to Infant.) I would guess that most of you have been impacted in some way by this illness, so you understand. Gary was sick for 9 years until he went to Heaven 2 years ago. For 3 of those years, I was caring for my sweet parents (both in their 90’s) who moved in across the street. At one point I was managing 9 caregivers between their house and ours. It was like we had our own Assisted Living Complex. Since I was one with my husband, this trial was for me too. Taking on Gary’s responsibilities was a crushing weight and we both had to give up so much. The transition was difficult. Could I be unselfish enough? Could I keep home with me? Would I love him enough if he didn’t know me and couldn’t love me back? We shed many tears together. We were weak and we knew it. Would Gary be belligerent, violent, and inappropriate, towards me, or would he be a wanderer? Would our love degenerate into insults and anger? Forced to close our business meant tremendous financial needs, and I worked at Starbucks for the medical insurance. Liquidating Gary’s inventory and equipment, and prepping our house to sell at the same time was a daunting task. Life was so hard – Leaving our home, and ministry, and not being able to help our family or babysit our grandkids was painful. All the while, Gary was growing more confused about who I was. What is distressing to you? What about your life is difficult, impossible to fix? Do you feel helpless? What do you dread? Are you Rejected, Alone, Persecuted? No one is exempt from the hard seasons of life, those times when you are at the end of your own abilities. Everyone here has a story to tell. Everyone’s suffering is intense TO THEM. I get to tell you how God worked through our trial, but we are in this together ladies. Today, we get to look at someone who has gone before us, into the valley of suffering, weak and helpless and found strength there. So let’s go together to the One who loves us, to God’s holy word, where all the answers lie. We’re going to be mostly in 2 Corinthians 12:7-10 so as you’re turning there, a little background. The Apostle Paul wrote this particular letter during the most painful time in his life. He needed to defend his authority and ministry to the Corinthian church, because false teachers were lying about him, and discrediting his ministry and were preaching some kind of a “different” and therefore false gospel. The people he loved and had poured his life into, were questioning his motives and what he had taught them. In order to protect them from error, he had to defend himself, even though he hated to do it. Paul gives multiple reasons to trust him because he was afraid they would be deceived. (v.3) His character, humility, honesty, love (v.9-11) contrasted with the false teachers who “enslave, devour, take advantage and exalt themselves.” (v.12-20) His suffering for the sake of the gospel, proved his integrity (v. 23-27), and his daily concern for them showed his caring heart (v. 28). In order to convince them, he BOASTS. Boasting is "to glory in", "be proud of." Why would this humble apostle be boasting? In v. 1 he said, “Boasting is necessary, (to protect them), though it is not profitable; but I will go on to visions and revelations of the Lord.”(v.1)….” Fourteen years before, (v.2) he had been “caught up into the third heaven, (v.3) paradise, and heard inexpressible words…” (v.4) He could have boasted in all these things, but he wouldn’t. Being transported to Heaven set him apart from all of the false teachers. But even though the vision experience was amazing, it was all God’s doing, and not his, so he refers to himself in the third person, saying “On behalf of such a man will I boast; but on my own behalf I will not boast except in regard to my weaknesses.”(v.5) The only thing in HIS LIFE he WOULD BOAST about, was his WEAKNESSES. That’s where God’s power was displayed most clearly, and the best evidence that Paul could be trusted. v. 7 “Because of the surpassing greatness of the revelations, for this reason, to keep me from exalting myself, there was given me a thorn in the flesh, a messenger of Satan to torment me – to keep me from exalting myself!" Paul could have easily become proud because of his vision so God gave him a thorn to keep him from exalting himself. In particular, a messenger from Satan influencing and driving the false teachers in this church. This thorn was painful. Greek for “thorn” indicates “sharp, painful, irritating; like a splinter or even a stake. It was extremely painful for Paul. When things are going well, we are all susceptible to pride. We love our autonomy and self-sufficiency, but God hates pride. He’s “opposed to the proud, but gives grace to the humble.” (1 Peter 5:5b) He gifted us with a trial. Our painful thorn was dementia. Gary gradually lost all control and I needed to accept help and seek advice. Not easy for a couple of ‘do-it-yourselfers.’ Our self-reliance gave way to beautiful ways to display grace in our lives. There were so many big decisions to be made, and my husband couldn’t lead or help me. For example… Should I continue going to church without Gary? Should my parents move to assisted living? How many caregivers could they afford to hire? What about “end of life” planning? What would Gary want? How long should my mom be on life support? After my Mom died, should my Dad live with me? etc., etc. Hooray for James 1:5. “But if any of you lacks wisdom, let him ask of God, who gives to all generously and without reproach and it will be given to him.” Absolutely true! Every time I faced a big decision, the Lord gave me the wisdom I was asking for. v. 8 Concerning this I implored the Lord three times that it might leave me. Paul begged God to remove the painful trial 3 times. For Paul to ask repeatedly, and then mention it, it must have been extreme. I too, prayed intensely for God to please remove our “thorn.” The Alzheimer’s would not go away, but we both prayed for relief and strength to endure. I repeatedly poured out my hurts to the Lord and was reminded of His incredible love for us. I too was driven to deeper intimacy with Christ. Others were drawn close too. Gary’s “I love yous” eventually stopped, and when the feelings of loneliness rose up, I called a family member or friend, to ask for prayer. 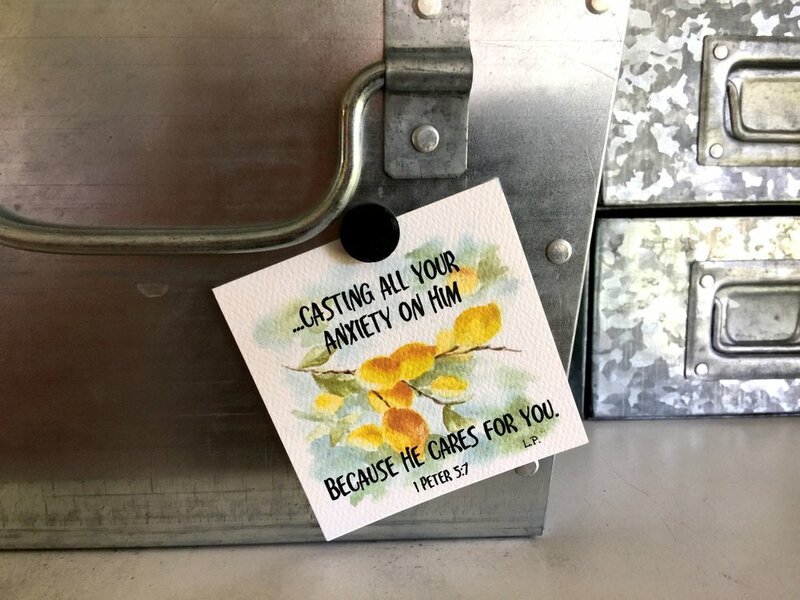 God heard every cry of my heart and provided encouragement every time I needed it; in the form of a special verse, note from a friend, or remembrance of something Gary had said in the past. God gave me more love than ever for Gary and reminded me that He loved Gary even more than I did. And now as a widow, God is my husband. God is replacing the loneliness in my heart with Himself. (1 Peter 5:6-7) “Therefore humble yourselves under the mighty hand of God, that He may exalt you at the proper time, casting all your anxiety on Him because He cares for you.” God is planning to lift us up as result of our hard times, (either by removing the thorn or giving us grace to flourish) so bring all your hurts to Him, because He cares. God answered Paul’s prayer. Not with “OK, your trial is ending now,” but with more than enough grace to strengthen Paul in the MIDST of it. We are completely dependent on GOD’S GRACE to live our Christian lives. My pastor, John MacArthur, says ‘Grace is like the air we breathe.’ Sometimes God sovereignly intervenes in some way independent of our actions, but Paul told Timothy to “…be strong in the grace that is in Christ Jesus.” (2 Tim. 2:1) We are expected to live lives pleasing to God. But how do we do that in the midst of difficulty, confusion, and sleepless nights? The Holy Spirit is in us, infusing us with grace as we engage with Him in four ways. Good news… For believers, this is not a throne of judgement, but a throne of grace. Jesus, your Savior is there, listening, caring, making intercession for you, He is going to help you live a godly life as you draw near and ask Him for help. Thank Him for His love and salvation. Ask for the spiritual strength to say “yes” to this situation. Ask for help with specifics; practical AND most importantly, character. “…word of grace to build you up.” (Acts 20:32) Like eating healthy food, sustains your physical body, assimilating God’s word makes for a healthy spiritual life. Sermons, Notes, Memorized verse that apply to your situation. Not just reading it, but doing what it says. Hiding it “in your heart” (Ps. 119:11) for a rainy day makes it available for the Holy Spirit to recall for you. There were times when I really needed truth. As Gary gradually stopped reading, talking, smiling and understanding it was heartbreaking, even depressing at times. But God used His truth to display His grace and give me comfort and even JOY. (Romans 8:32) “He who did not spare His own Son, but delivered Him over for us all, how will He not also with Him freely give us all things?” This verse became precious to me because, if God gave the very greatest gift (Jesus Christ) for our good, then everything else He gives is good for us too. It became my go-to verse when tempted to despair. By (Phil.4) “thinking about what is true.” God healed my broken heart and not just once! Facing the fact that this trial was not going to go away, God gave me grace to think of ways to give Gary a meaningful life. (i.e. making his flip book, memory books, PVC and screwdriver board) This has turned into a way to help others on my website. When we take God at His Word, and believe him, we find JOY! Shortly after Gary’s diagnosis, Gary asked me to find the Alzheimer’s Association website so he could read about what he was facing. (Memory Loss, Confusion, Personality changes, Repetitive behavior, Loss of communication, and the ability to walk, sit or control his body. Eventually he would need full time assistance with everything.) I watched him read the list, with tears in his eyes. He never asked about it again but a few days later he prayed and asked God “that during his illness, he never do anything that would dishonor the Lord.” He feared that as he would lose control of his mind, he would do something sinful, but Gary didn’t panic, get angry at God, or beg Him to take it away. Gary was content with the biggest, scariest trial he would ever face. He submitted himself to God’s plan for him. And God did answer Gary’s prayer. Be willing to accept help from Christians AND non-Christians. Practical Help: Humbling to let someone into your “kitchen.” Remember, there are many ways to do things. Spiritual Help: Be vulnerable to others and cultivate a small group (including spouse & elders) you can really trust. v. 9 And He has said to me, ‘My grace is sufficient for you for power is perfected in weakness.’ Most gladly therefore, I will rather boast about my weaknesses, so that the power of Christ may dwell in me. Paul didn’t love the pain, but he did love the amazing grace that lead to spiritual power. He had to be weak in order to be powerful. GOD’S STRENGTH ACHIEVED IN HUMAN WEAKNESS. Anyone who thinks they are “strong” are fooling themselves. The phrase: “You’re such a strong person” is a joke. It’s God’s strength we need and that is a byproduct of the grace He displays in our human weakness. As Christians we want Jesus Christ to be lifted up and not ourselves. You can put your confidence in God. v. 10 Therefore I am well content with weaknesses, with insults, with distresses, with persecutions, with difficulties, for Christ’s sake; for when I am weak, then I am strong. How often are we well-content with our trials? I came to love how Gary’s illness displayed God’s grace and power in our lives. I found out that when we were the weakest, we were the strongest. Forty-two years ago I said “…till death do us part.” Two years ago God parted us and I said “good-bye” to my Gary. Gary is in Heaven with his Savior. He is fine now, "extremely fine.” He is finally "home" and I am so relieved and thrilled for him. His mind is whole. He is experiencing joy like never before. If you DON’T have a saving relationship with Christ, you might be asking, “What’s so great about knowing Jesus? God wants to show His strength and glory through people, and so he gives them something painful.” If you look around you, you’ll see that suffering, loss, pain are part of the human condition. Everyone is subject to them. Way back in the Garden of Eden, sin was unleashed in the world because man and woman (and all men and women since) chose to assert their own will over God’s. God made the universe and everything in it. He is holy and perfect. It is SIN that has brought the curse of suffering into the earth and eternal punishment and separation from God. If you are unsaved, I am sad to tell you, the grace of God is not available to help you with life’s hurts and struggles and this is the best life you will ever have, and any sufferings during this life are nothing compared to the eternal torment that that awaits you after you die. Our sins separate us from God, BUT long ago, God made a plan born of His love. Here’s the GOOD NEWS! BY GRACE, He would freely offer to mankind, a perfect substitute (that’s Jesus Christ) who could bear the punishment for the sins of any who would repent and believe. His anger satisfied, and the gap bridged. So GRACE is being offered to you today, by God Himself. There is no victory, no success apart from Him. Will you humbly admit that you are helpless to please God, turn away from your own efforts to do so, and believe what He says in His word? For believers, the grace of God is available to help you suffer “well” knowing that God is your loving Father, and these sufferings will be nothing in light of the glories of eternity where there will be no suffering; only joy in His presence. If you are hurting or weak today, BE ENCOURAGED! GOD WANTS TO GIVE YOU HIS ABUNDANT STRENGTH. Sometimes it comes in surprising ways, sometimes, day-to-day, but His grace is “super-abundant” and He doesn’t waste anything. Every single thing in our lives are for His glory and our good. So see your weaknesses as a good thing, bring your troubles to God, to know Him better, and then keep relying on His grace and power working in your lives. Will you thank Him for the grace to endure it with joy? I’m right there with you Ladies. I have to remember these things too. Widowhood has its own unique thorns and struggles as I find my footing in my new role. My hopes of Gary smiling at me, or saying a word, or noticing if I walk through the room, are over. I will never have that again. But I am so happy for Gary. I can’t wait to see him again, in Glory, where he and I will be face to face with the One who gave us the power to keep our vows and love each other “no matter what.” I'm forever grateful to God for that. And grateful to you for letting me BOAST about His wonderful grace!